It wasn’t too long ago that we’ve seen technology companies developing their products using the waterfall method, particularly the leading players in the financial industry. The use of waterfall was largely due to the threat of changes in high regulated operations, the tendency not to leave their comfort zone, and the corporate politics factor. ‘Don’t risk the failure of something new if the existing one works’ – this was the common conception in financial institutions. It is that exact mentality that creates a recipe for failure with today’s agile UX, innovation and disruption. Prior to the 2008 financial crisis, the technology development departments in the financial sector were impossible to touch efficiency-wise and cost-wise as long as they didn’t go too far. Think of them like a kid at a candy shop – they were provided tech to operate, and as such, they got every budget they wanted; then, efficiency and speed weren’t demands. After the 2008 crisis, however, technology departments were asked to reduce costs while staying on the cutting edge of technology. Aside from the crisis, these institutions noticed that startups can accomplish within one week the tasks that their departments completed in one month. This was when the bell started ringing. No longer are the “big guys” the leading players in the Fintech space. In such a short period of time, we have seen startups “chip away at the banks” and attack the niche by making services cheaper, faster, and more convenient. Consumers are not even considering banks and financial services firms to be the inspiration behind the most innovative financial products. These financial institutions are aware of that. That’s why they’ve taken to investing in startups to encourage fintech innovation. “The big financial services companies are often hindered by outdated technology so smaller tech firms help them reduce the time needed to develop new products and – more importantly -strengthen their competitive position,” claims Matt Riley of Accenture Strategy. Today, in order to keep up with the pace that is the Fintech space, it is necessary to have UX become a part of the agile methodology. Here are 5 user stories that will help you get aligned when adopting Agile UX for financial technologies. 1. As a UX designer, I want to understand the business, the jargon, user motivations, & the market, before I conduct my design research. You’ve been hired by a Fintech company and they want you to get going ASAP. The first crucial tip to being a successful UX designer is to understand the business. It’s true…it’s impossible to quickly learn every financial profession and master it in three weeks, but then again, you are smart enough to understand and analyze the answers you get from your client. If you can’t conduct design research without preliminary learning, you will not understand half the answers you are getting from users and most likely – users won’t talk to you. They will perceive you not as the UX expert that you are, but someone who is not connected. To them, time is money, and that if they perceive you as disconnected, you are a waste of time. Applying this is indeed applicable to UX in general, but is crucial for your professional fitness. This is a MUST first step to getting your foot in the door of the Agile UX process. 2. As a UX designer I want to attend all daily Scrum meetings. Daily scrum meetings are an essential part of Agile. These set the pace of the work and define the context of the coming day’s work. Scrum meetings not only keep you on top of goals regarding the big picture, but also provide your input to your team members about components you are currently working on, issues you encounter, and sometimes provide a UX solution to a technical problem. 3. As a UX designer I want to maintain a backlog of my own. The Scrum backlog is where UX designers keep all of their ideas and tasks needed to be completed that haven’t adjusted to the product’s roadmap yet. If you will, sometimes we have good ideas, great ideas even, but no plans to execute right now, and as humans, we frequently forget things. The backlog provides an opportunity to save those ideas for future opportunities. 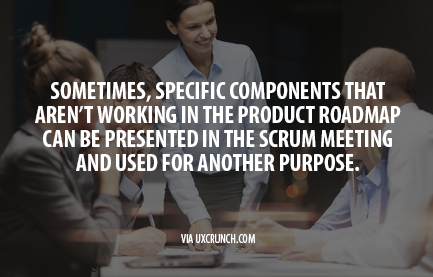 Be sure to influence your backlog and share your inputs from users as backlogs may evolve during Scrum meetings. 4. As a UX designer I want my backlog to be aligned with the Products Owner’s backlog. By default, the UX designer and Product Owner tend to step on each other’s toes (fact of life, get over it). Aligning a backlog will help smooth things out and allow for better collaboration and teamwork, not to mention provide better delivery in the scheme of things. 5. As a UX designer I want to have the Product Owner and the Dev Team Leader as my wing mates. In general, UX designers always want to be on everyone’s good side. However, the nature of working relationships with the Product Owner and Dev Team can make the difference between an O.K. product to an awesome one. Make sure to be transparent with your team members. Remember, communication is key. While these 5 User Stories for Agile UX will help you align yourself for developing an innovative Fintech product with your team members, tips and best practices to succeeding in Agile UX are not limited. As a UX designer, what other tips can you share that have helped you succeed in Agile UX and product development? Feel free to get in touch with us to share your tips via Twitter or Facebook.